You can buy the modern armchair Hanna online or at our showroom in Meda. 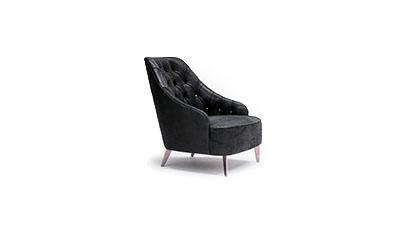 Hanna is a armchair with modern design realised in the BertO Sartorial Upholstery department. Its unmistakable style is the result of a meticulous study of the most exclusive materials such as the upholstery in precious water-repellent nabuk leather. The black embossed powdered steel structure supports the modern, extremely comfortable ergonomic seat. We are constantly renewing our showrooms so this is why we are able to offer the best products at reduced prices while retaining all the quality of our BertO Sartorial Upholstery.